Xconomy: Who is Dara Khosrowshahi, Uber’s Pick to be CEO? Who is Dara Khosrowshahi, Uber’s Pick to be CEO? The news broke Sunday night that Uber has offered the job of CEO to Dara Khosrowshahi, the outspoken steady hand guiding Bellevue, WA-based online travel giant Expedia (NASDAQ: EXPE) for the last dozen years. So here are some things to know about the man who would take the steering wheel at Uber, a $68 billion private company beset by scandal, tumult, and high-profile lawsuits—but one that is transforming how people move in cities around the world. Khosrowshahi is 48. He was born in Tehran, Iran, and immigrated to the U.S. in 1978. His last name is pronounced “cause-row-shah-he,” per a tweet from his cousin, Hadi Partovi, another Seattle-area Iranian American technology executive. Partovi and his twin brother, Ali Partovi, co-founded the computer science education group Code.org, and are also active tech investors, having backed Facebook, Airbnb, and Uber, among others. Khosrowshahi is proud of his Iranian heritage. His family fled the Iranian Revolution, and he is outspoken about the contributions immigrants make to the U.S. economy, particularly in tech. Expedia was among the first companies to support the state of Washington’s lawsuit challenging the Trump administration’s ban on travel from predominantly Muslim countries earlier this year. Iran was among the countries on the travel ban list. Partovi told the New York Times, “Every one of us cousins had a chip on our shoulders, having lost everything to the new Iranian government. We had a desire to build anew as entrepreneurs.” As the Times notes, at least five members of Khosrowshahi’s family have prominent positions in tech or tech investing. Khosrowshahi’s 12-year run as Expedia CEO saw the company’s shares increase about 295 percent through the end of July, compared to the Nasdaq’s rise of 196 percent during the same period. Today Expedia has more than 20,000 employees around the world. 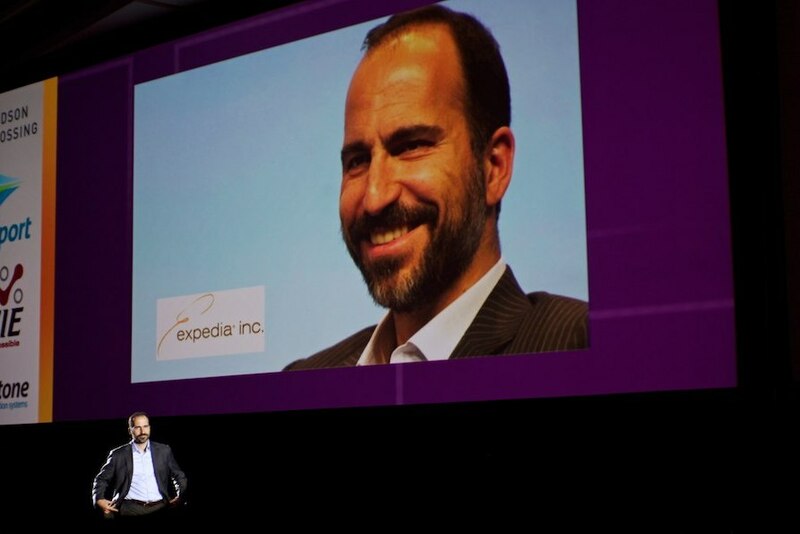 Expedia shares closed down about 4.5 percent on Monday, after word got out that Khosrowshahi was offered the Uber post. Khosrowshahi oversaw a series of large acquisitions by Expedia, including the $3.9 billion purchase of HomeAway and the $280 million acquisition of Travelocity, both in 2015. He was ranked 39th on Glassdoor’s list of highest-rated CEOs this year. He is not afraid of making major changes: In 2015, Expedia announced plans to uproot itself from its longtime Bellevue headquarters, relocating a large portion of its operations to the waterfront north of downtown Seattle. Expedia has been building out the campus, previously the Seattle home of biotech giant Amgen, and plans to move in around 2019. He’s an eager investor in modern transportation companies, including Seattle-based Convoy, often described as the Uber for trucks, which raised a $62 million round earlier this summer. Photo credit: Khosrowshahi in 2012 by George Grinsted via Flickr used under a CC BY-SA 2.0 license.